NEW YORK TIMES bestselling author Tamora Pierce takes readers to a world filled with adventure and magic. 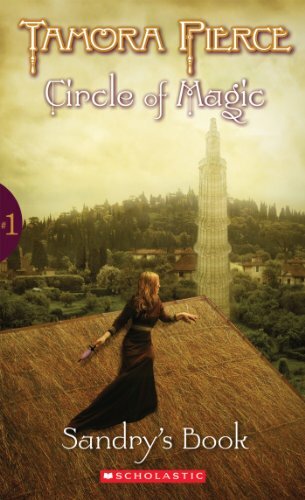 In Book 1 of the Circle of Magic Quartet, gifted young weaver Sandry is brought to the Winding Circle community. There she meets Briar, a former thief with a way with plants; Daja, an outcast gifted at metalcraft; and Tris, whose connection with the weather unsettles everyone, including herself. The four misfits are taught how to use their magic, but when disaster strikes, it's up to Sandry to weave together four different kinds of power to save herself, her friends, and Winding Circle. RemusLupin (Grade: B) The characters in this story are interesting and diverse and the reader eagerly watches them grow and adapt. However the book sometimes struggles with pacing and with juggling all four characters' perspectives. Still, the author does a good job introducing the universe and setting up the central plot/conflict for the series.